During the late 50’s and 60’s many companies left their old out of date factories in Birmingham and the black country and moved into new premises springing up in Aldridge and Brownhills. This prompted many of them to get together and form an association known as the Aldridge Brownhills Manufacturing Association ( ABMA ). At the same time the membership of the local Rotary Club increased and many new friendships were formed. With the coming together of these men and the forming of new friendships it became apparent that many were already Freemasons and therefore members of Lodges elsewhere. The Rotary Club and ABMA both met at the Elms Public House in Aldridge and it was at one of those meetings that WBro D Lowndes, chairman of Aldridge Plastics Ltd, said to WBro AK Spencer ‘ We ought to form a lodge in Aldridge ‘. Both were already members of the Lodge of Loyal Service No. 5890. WBro Spencer took up the idea and spoke to WBro H Franklin Bill Provincial Grand Secretary of the Provincial Grand Lodge of Staffordshire. He agreed to give every assistance in forming a new lodge in Aldridge which was in Staffordshire at the time. 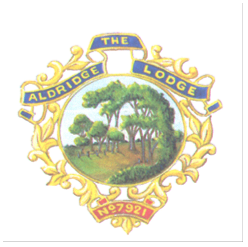 the new Aldridge Lodge. Twenty were soon found eighteen from Warwickshire and two from Staffordshire namely WBro Ted Pugh and Bro Harry Lockley. A meeting of the Brethren was then called at the offices of Phipps Packaging Ltd of which WBro Spencer was chairman. Interestingly Lodge of Instruction meetings were held in the company canteen for a number of years. Provincial Grand Lodge dues and a meal and drinks at each Lodge meeting.